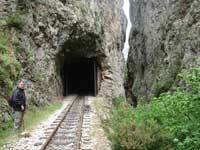 Diakopto is located 22 Km near Kalavrita. 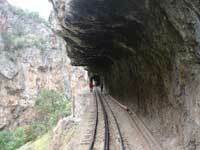 The journey takes one hour and the speed of the train ranges between 30 and 40 Km/h at usual rail and 6 - 15 Km/h at cogs. 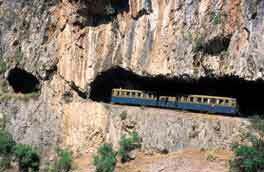 The slope of the ground does not allow the movement of a usual train, so between the rails there are cogs that allow the operation of a mechanism to raise the train from the level of the sea at the station of Kalavrita which is 750 metres above the sea level. 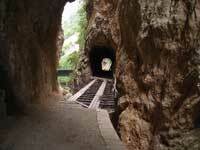 The little cog train known in the past as the 'odontotos' (= tooth train), is well known to train lovers all over the world, because its journey along the gorge, is one of the most spectacular railway rides. 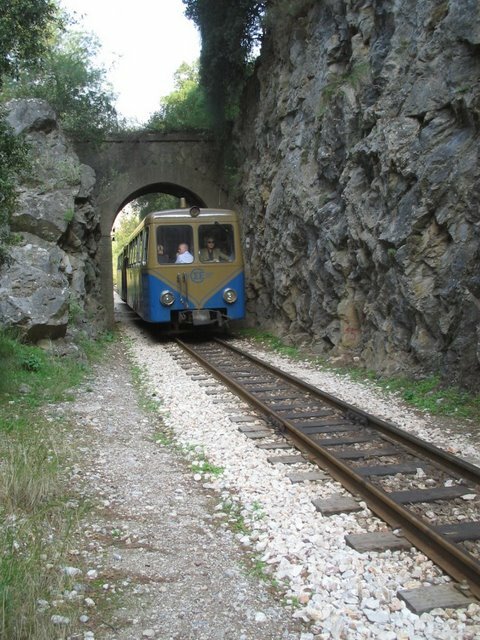 It consists of two Decauville passenger wagons with the small diesel unit engine in between.The narrow gauge tracks follow the stream bed of the Vouriakos river and the little train travels through streams climbing the fantastic narrow gorge up into the mountains, through tunnels, over waterfalls, along cliffs and through forests of pine and oleander. When the incline gets really steep it switches from regular track to a cog system. 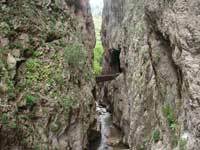 Occassionally you meet people hiking down the gorge and the train has to slow down to a crawl while the pedestrians hug on the walls of the cliffs. 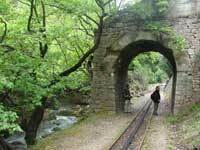 Zachlorou is the train stop before Kalavryta where many people get off the train to hike downwards the gorge. You are advised to check with the train station in the tel: 0030 1110(Railway Telephone Center) in order to verify the timetable.